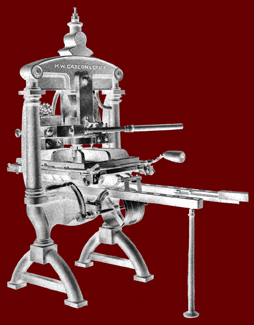 This site represents a catalogue of the printmaking of Arvon Wellen for more information about printmaking techniques, history and sources of materials go to the ARTOFTHEPRINT site. There are also pages about galleries and print workshops. In the column on the left of this page are links to paintings by ARVON WELLEN as well as links to the Aragó Press for information about artist's books. This small once upon a time fishing village on the northeast coast of Spain is now a popular resort, not just for the residents of nearby France but it attracts many visitors from Germany and Britain too. For many people the attraction is the sea, the sun and the many bars and restaurants but they may also appreciate the real treasures of this isolated peninsular, which are the light and the tranquillity of the surrounding natural park of Cap de Creus. The history of Cadaqués will always be entwined with the life of the artist Salvador Dalí who lived in the secluded bay of Port Lligat where there a museum now exists in the house that he shared with his wife Gala. Dalí was not the only artist associated with Cadaqués, other important artists worked, lived and visited the village over many years. Marcel Duchamp lived here and Richard Hamilton had a studio near the church. The Mini Print exhibition at the Taller Fort gallery has encouraged printmakers from all over the world to participate in this annual event. 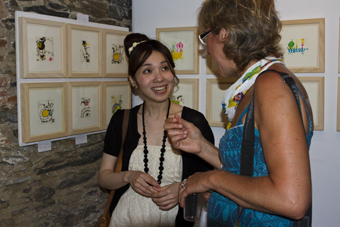 Artist Junko Funada, one of the six winners of the Mini Print whose work was exhibited in the Taller Fort gallery during the summer of 2011.